the holidays are upon us and i'm thrilled to say i'm done with all my shopping, whew! i never intended to be done so early and i've never pulled this off before but with an upcoming office move, onward, and all that it entails, i decided if i was going to be able to enjoy the season i'd better get a jump on it. for those of you who are still scrambling i've put together our five gifts for under that $50 price point. for the host/hostess: who doesn't like a nice candle? visiting friends and family: kai travel set, i love leaving these in the bathroom for my guests arrival. 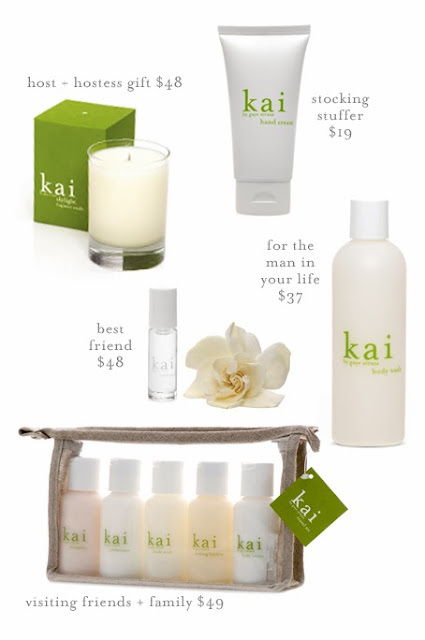 the man in your life: kai body wash, i promise you he will love it! best friend: kai perfume oil, my personal favorite.